How are you thinking about setting your goals for the new year? What are your intentions for 2018? What is important to you and how will you point yourself in the right direction to achieve your goals and create better habits? I’ve never liked the word “resolution” because it conjures in my mind lofty goals that are often not achieved. In the dictionary, resolution is defined as “a firm decision to do or not to do something”. Making a firm decision is a necessary part of achieving goals, but it isn’t sufficient. I’ve already noticed that the gym is more packed than it was at the end of the year….but like always, I anticipate that this will change in the next month or so as people lose their motivation. I prefer the word intention. We need to have intent to how we WANT to behave, otherwise we’ll just fall back on our old habits and practices. Of course, it is also essential to have a plan of how you are going to practice, and a process to reflect and learn about what is working or not. But without having intention – of knowing where we want to go and thinking about how we are going to get there – it is unlikely that we will be successful in not living by our old habits. 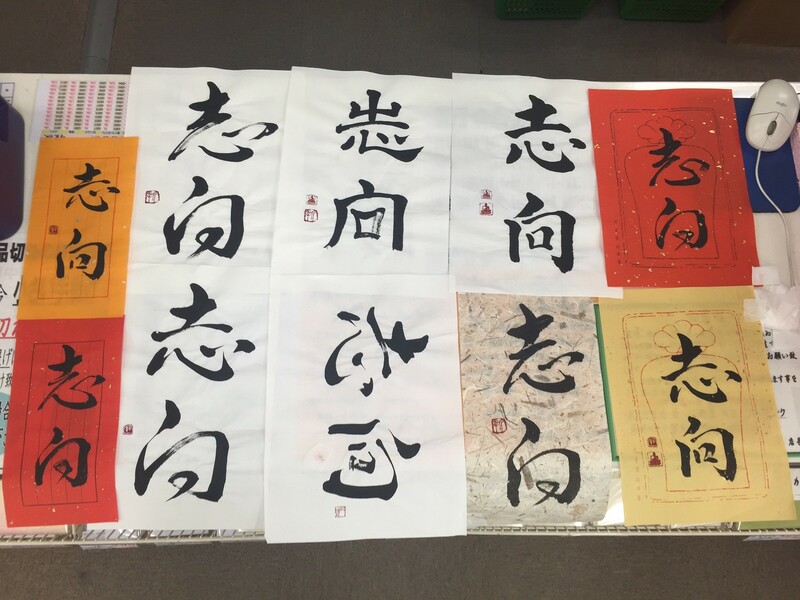 Before we left Japan, I had the Japanese word for “intention” (“shikou”) written in calligraphy to frame. I still need to choose my favorite and get it mounted. That should be one intention for this year! In addition to deciding WHAT you want to accomplish, you must also connect with WHY this goal is important and develop a defined process for HOW you will accomplish the goal. I chose the word intention to be the symbol on my Japanese business cards as it is a word that is meaningful to me both personally and professionally. 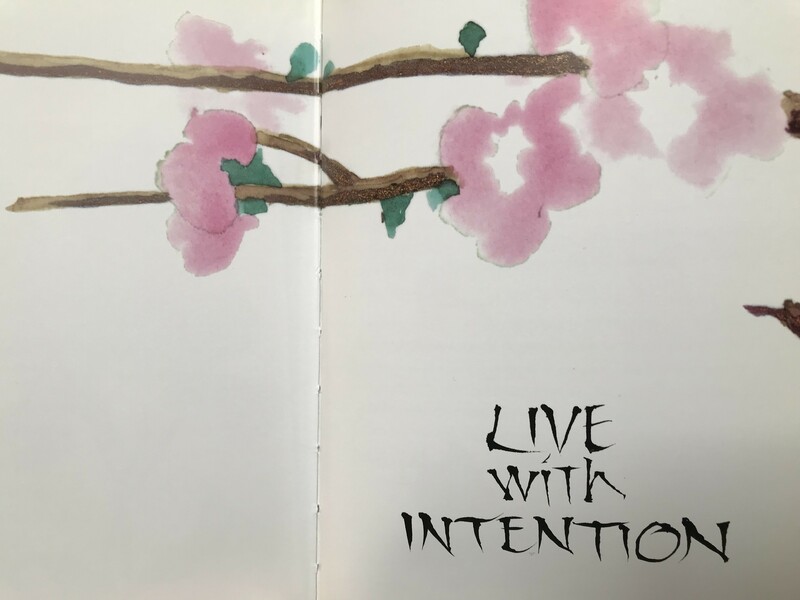 I later learned that in Japanese the word “intention” comes from the characters meaning “heart”, or WHY it is important inside, and “direction”, HOW you line up your actions with WHAT is important. I now find the word intention all that more meaningful. We should have intention in how we live, how we lead, and how we show up each and every day in the choices we make. Connecting with our heart can help point us in the right direction. It was the perfect gift by someone who has supported me in recognizing my intentions and pointing myself in the direction to achieving them. Three years ago this week we moved to Japan and I started to write content for this blog (even though I didn’t have an actual platform set up for publishing…that came a few months later). In that first post, I laid out my intentions for how I wanted to use our gift of eighteen months in Japan, and since then have regularly set and reflected upon the annual intentions I’ve set out for myself, such as this recent post looking back on 2017. It was exciting to see my professional coaching and coaching practice grow over 2017 both within the U.S. and internationally. I ran many experiments and said yes to a lot of work and personal opportunities. I learned a lot – including what worked and didn’t work so well – which I shared with you in the post: Reflections on 2017: “Today is a Great Day”. Now in 2018 it is time to focus on what is the most important to me and make sure I’m pointing myself in that direction. 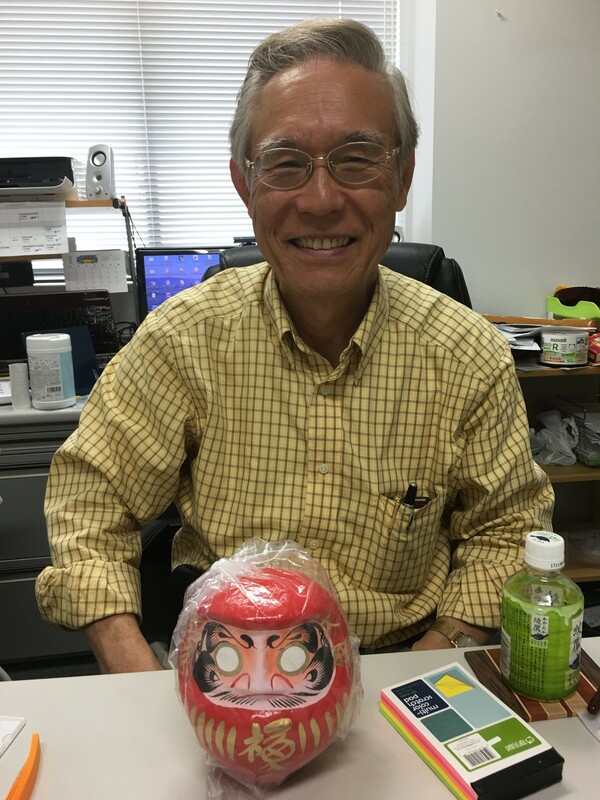 Mr. Isao Yoshino with the daruma I brought for him from Takasaki in May. At the European Lean Educator Conference (ELEC) in the Netherlands two months ago, I went through Mr. Isao Yoshino’s exercise of exploring my own personal hoshin kanri on an A3 sized paper as part of a half-day workshop on strategy deployment at Toyota. Back in May Mr. Yoshino had encouraged me to develop my own A3, and as I wrote in the Lean Post, not to get hung up on the format of the examples he provided, but to make a format that worked for me. When I actually put pencil to paper, it was clear that I had too many things going on professionally or that I wanted to do. I spent the bulk on my time putting down everything that I saw on the horizon or things I was interested in. This took up most of the paper. Playing catchball – sharing draft thinking and receiving questions to prompt deeper thinking – is an important and helpful process to gain clarity on any problem, plan or issue. During the workshop in the Netherlands, while going through catchball with Mr. Yoshino and Gunars Caune, I realized how unrealistic it would be for me to accomplish everything that I’d laid out in my professional hoshin for 2018. It became clear that for my professional goals I needed to develop some focus and prioritize what is most important to me to to this year. Gunars and I have a follow-up catchball session next week to share each of our revised hoshin plans, so I wanted to spend time this week to develop mine more robustly. Anytime you can make something visual – through a graph, picture, or timeline – it can add clarity. Mr. Yoshino and I also talked later that day about how it may be helpful for me to develop a timeline for each of my major activities so that I could see how I am level loading work and travel, as my activities are not constant throughout the year. I haven’t done this on my A3 yet, but I have a visual map on my calendar that helps me see which weeks I can travel or not. Before I could go further to create a 2018 plan, I needed to step back and identify what is most important to me professionally – to define the “heart” aspect of my intentions so that I can point myself in the right direction. The past few days, I spend some desk time in reflection to identify what is important professionally, building off the annual reflections and lessons learned that I had in 2017. Have a meaningful and positive impact on the people with whom I work – be it coaching, consulting, teaching, facilitating. People development is what excites me. Develop ongoing / longer-term relationships. Prioritize local work or work that I can do locally/remotely, but leave some time for opportunities that require travel (priority to international travel a few times a year or places where I can also connect with family and friends – not to exceed personal target of no more than 50% of time away from family in one month). Dedicate time to reflect, create, learn and connect. 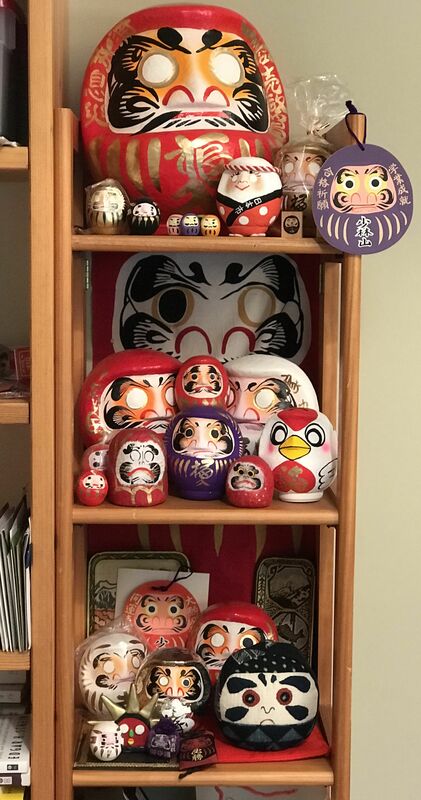 Just part of my extensive daruma collection. After defining what is important, you can better define WHAT to do and HOW to do it. You can then create your plan or hoshin. Based on the intentions that I was then able to more clearly figure out what to focus on – and create some guiding principles of what to say “no” or “not right now” to. Some of this is a work in progress and will get more clearly defined as the year progresses, but I have a clear sense of the first half of the year and some ideas of what might play out for the second half. Use a daruma for a visual reminder of goals and perseverance! For some of my personal and professional goals and intentions, I have already filled in the eyes of some of my darumas! 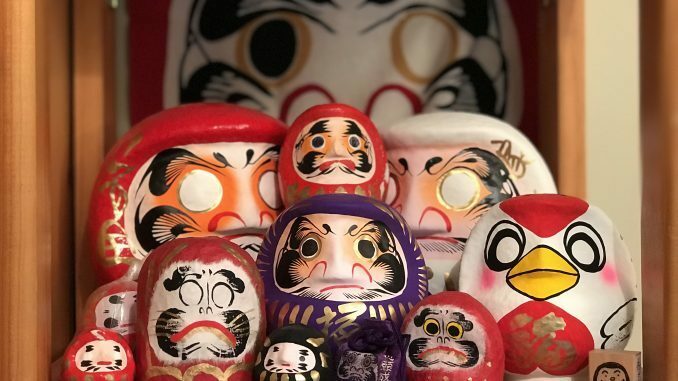 (If you don’t know what a daruma is or how I came to be so obsessed with them, check out these links to learn about the history and role of daruma dolls or my visit last May to the “daruma capitol” of Japan). Experience the customer service (omotenashi) and precision turn over in Japan. 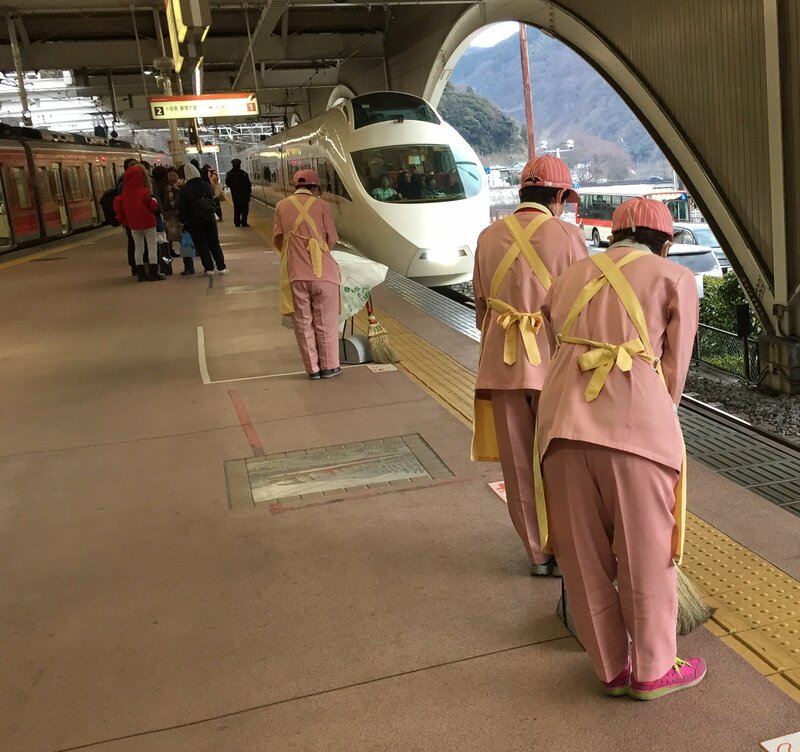 Here are cleaners bowing as the Shinkansen (bullet train) arrivals at the terminal station. I’m excited to be going back to Japan in less than two weeks to prepare for the study trip I’m leading for the Ohio State University in May. 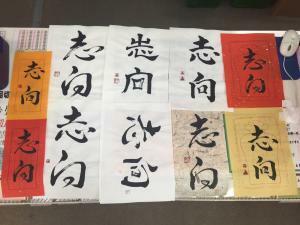 I’m looking forward to seeing many of my Japanese connections while we are there, including Mr. Yoshino, Mr. Sumiya of Toyota Memorial Hospital, Mrs. Ogura in Ashikaga, and Tim Wolput. And of course experiencing the omotenashi (customer service) and amazing food that Japan has to offer! I also will spend time with friends and my former Japanese teacher, who I’ve asked about having regular Skype appointments to practice the language I am forgetting so much of the Japanese that I learned when we lived in Tokyo. 2018 goal: Lead an amazing trip to Japan for OSU and create an ongoing program in collaboration with the university for future learning experiences. Explore opportunities to develop trips for other groups. Looking ahead to 2019: Are you interested in going to Japan with me in 2019? I’d love to help your organization put together a fabulous learning experience based on the connections and insights I have made. Update – goal realized! 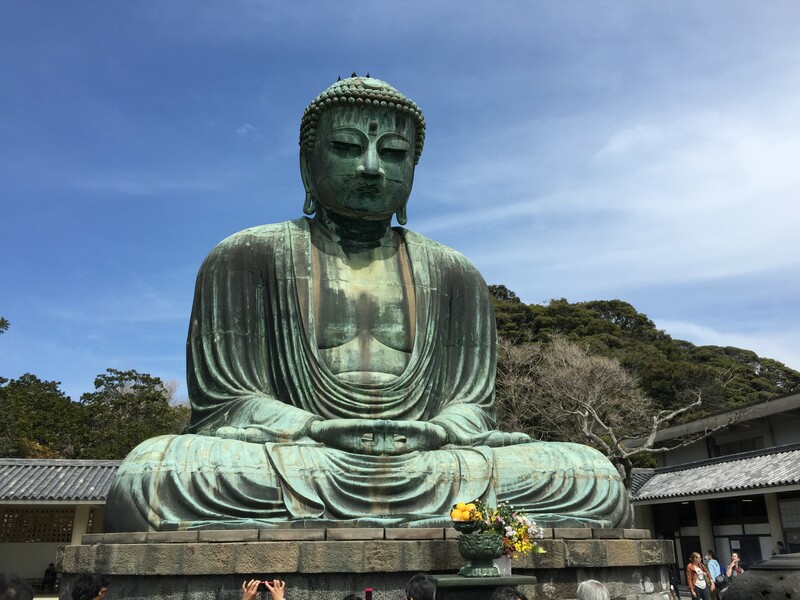 Check out the Japan Study Trip page on this website to learn about the next learning trip to Japan that I’m leading in May 2019 and others in the future. Are you in the San Francisco Bay Area? 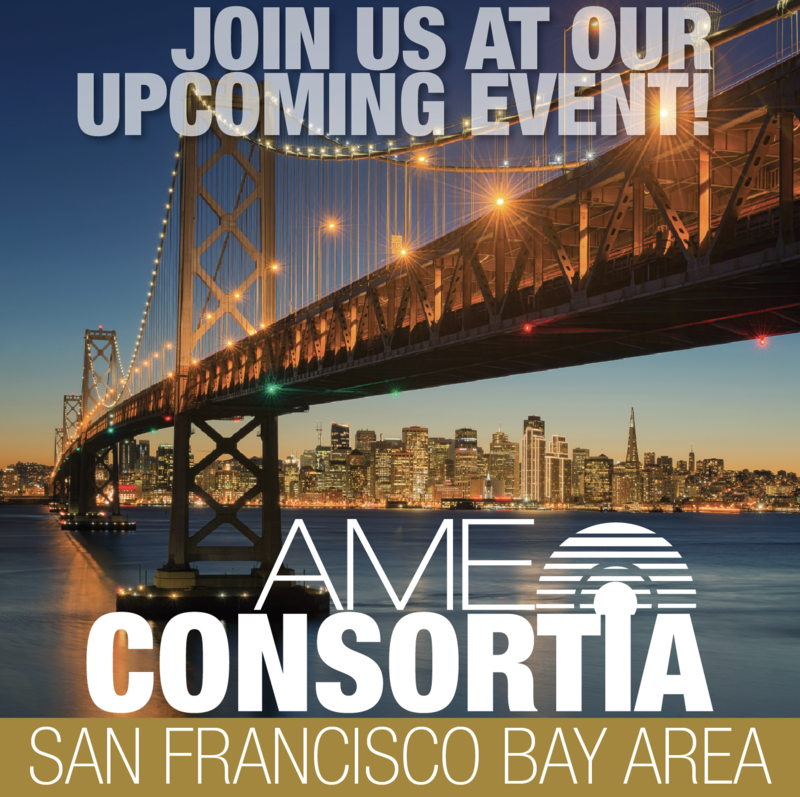 Join the new AME San Francisco Bay Consortium! 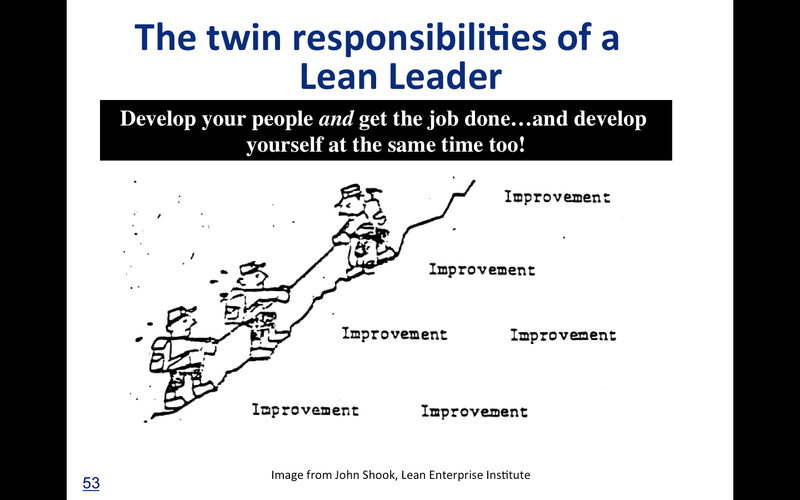 I’m thrilled to be facilitating this lean learning network and be officially connected with AME. It was a no-brainer to say yes to this opportunity as it hits so many of my professional intentions: learning, connections, longer-term relationships, and locally focused work. My 2018 goal: Get the Consortium up and running and make it a successful network of 10 companies by the end of the year, as measured by 100% of companies renewing Consortium membership for 2019. 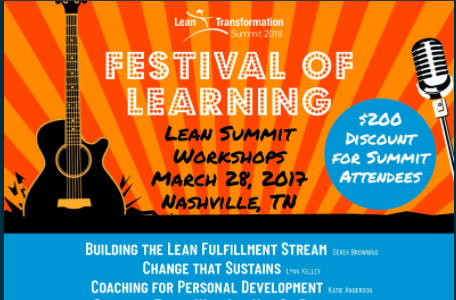 Join me in Nashville in March to learn and practice fundamental coaching skills – and how to use the Personal Improvement A3 framework. I look forward to continuing to work with my current clients and exploring other opportunities this year for coaching, teaching, consulting or speaking. 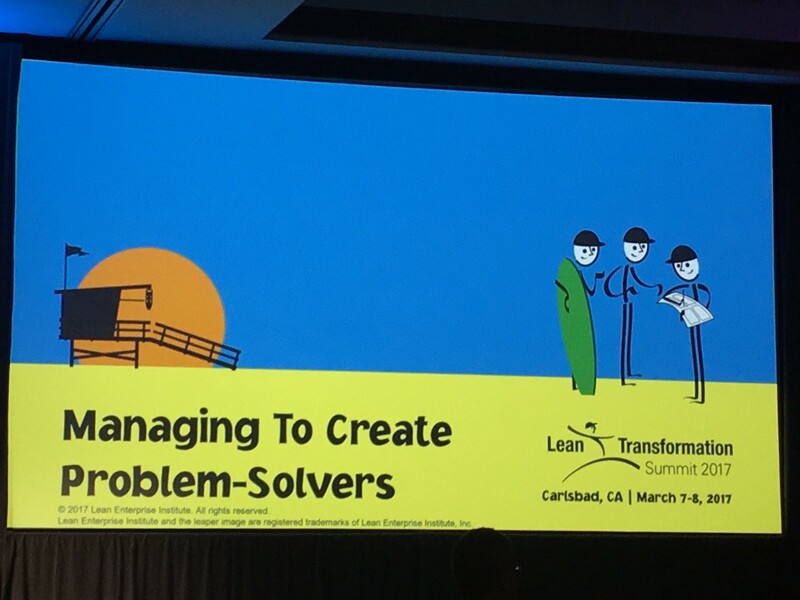 Some aspects of my work in this area is less defined as some engagements are one-off events or ad hoc – like the 1-day “Coaching for Development” workshop that I’m teaching in March at the Lean Transformation Summit in Nashville! I’ve also been exploring more engagements that augment in-person coaching and consulting with remote follow-up and coaching. In addition to my client work and faculty partnership with organizations like Catalysis and LEI, I also will continue to be a coach for two students as part of the OSU MBOE program and I volunteer on the boards of two organizations locally. 2018 Goal: Don’t say yes to too many things and become overcommitted, and thus break personal “with family” time goal. Use intentions and priorities to filter what to say “yes” or “not right now” to. Writing this blog has been a way for me to reflect, create, and connect. It is important to me for all of those reasons and I want to make sure that I find time for either writing for this blog or to work on new content. I’m also excited to be redesigning the layout of my website – and look forward to unveiling it sometime later this year. It’s also important to me to maintain and create personal connections with colleagues locally and around the world. 2018 Goal: Write or produce new content to publish something at least 2x month (either a blog post, webinar, guest post, article, etc) or spend some time working on creating new materials or content. I’m sure my thinking will be come even more clear and concrete as I experiment, play additional catchball, and reflect. I look forward to what 2018 has in store, and to make every day, as my father would say “a great day”. How will you use the concept of intention and personal goal setting / hoshin planning to start your year? In future posts, I will share highlights from my upcoming trip to Japan and another installment of “Toyota Leadership Lessons” about insights learned from Mr. Isao Yoshino. Thank you for reading and, as always, I welcome your thoughts and comments below. This post ended up much longer than I’d originally intended!